BEST IN THE MIX: VIDEO: Mysonne - What's Going On? VIDEO: Mysonne - What's Going On? There are many pillars to the hip hop foundation. And right now the battle rap or "beef" side is getting top billing. Really the whole Ghostface vs Action Bronson drama is not even worth labeling a beef because no pens are touching paper. And the Drake vs Meek Mill joint would take an entire separate article to vent my reaction. But an aspect of hip hop that I feel gets little to no shine is the social commentary element. From Grandmaster Flash and the Furious Five's The Message (1982) to Kendrick Lamar's Alright (2015), hip hop has had the power to bring attention to social issues on a greater scale. J Cole's Be Free was a tribute to Michael Brown but also addressed the duality of fearing for ones life from those who have been charged to protect it. A lesser known emcee recently dropped a music video to his Marvin Gaye inspired track, What's Going On? Bronx emcee Mysonne has been in the game since the late 90s but achieved some notoriety in the mid 00s. He teamed up with the Justice League (no not that one) to march from New York to DC this past April. 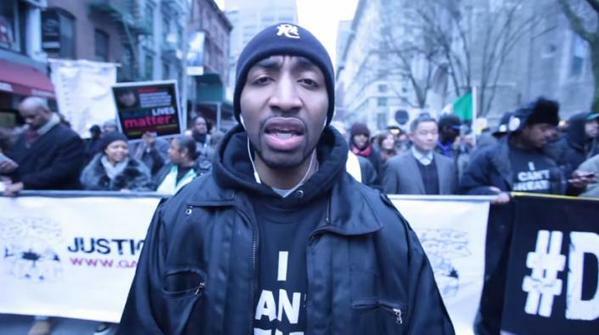 Mysonne is in New York, but he seems a little to layered to be marching in April. But it is possible that the video was taken from the start of the MARCH2JUSTICE. Since I've seen this video there has been another person who died in police custody and new police camera footage of another police officer shooting another person in the head. So while the subject matter is depressing and horrifying, it is good to see hip hop use it's reach to keep these issues in the forefront and hopefully start the healing process. Peep video for Mysonne's track below, as well as original track he sampled from Marvin Gaye.